It’s funny how one search on Google can lead to more and more. That’s what happened when I did a search to see what climate Alyssum likes. I noticed we have tons of seedlings growing in our front yard right now and it’s fall and getting colder. First thing I learned (from Wikipedia) was that there are 100–170 species of Alyssum and they are in the Brassicaceae family (the Broccoli/Cabbage/Kale family), which I knew. I was surprised to find out that the Sweet Alyssum growing in our front yard is not in the genus Alyssum (although it use to be), but in the genus Lobularia – Lobularia maritima. 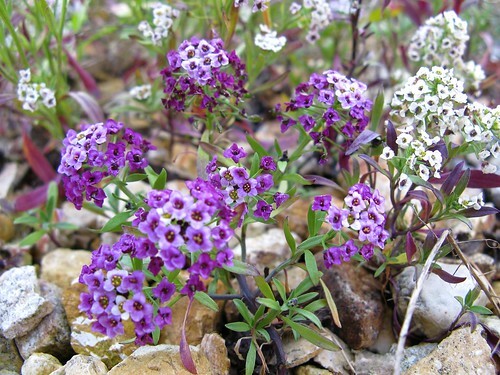 There’s another close relative to Alyssum called Aurinia. I saw a photo on Wikipedia and it looks very similar to a plant that my brother bought and neglected, although it’s still surviving in its cell pack container. A few months back I took a few plants from it to grow myself. I’ll have to check if I can find the tag and see if it is an Aurinia. One final thing I learned was that the yellow Alyssum that I’ve been trying to grow for several years from seed (but never germinated) is an Aurinia; Aurinia saxatilis or Gold Dust Alyssum. The seed package says labels it as Saxatile compactum. It’ll be funny if we’ve had the plant I’ve been trying to grow from seed all this time. Although it has never bloomed, so I wouldn’t have known. So, I discovered all this because I was searching when I should sow the Alyssum Eastern Bonnet Series – Deep Rose seeds I purchased recently. This entry was posted in Gardening and tagged alyssum, alyssum deep rose, alyssum gold dust, discoveries. Bookmark the permalink.